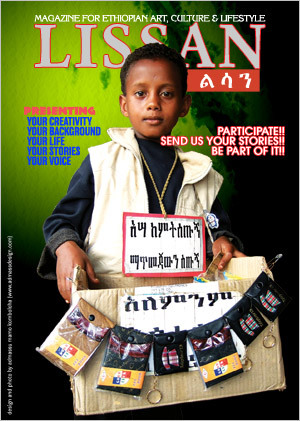 Lissan is a nonprofit online magazine, a platform for all Ethiopians and for those who are interested in Ethiopia. The Lissan team is not keen on choosing a topic and persuading you to read it. Instead we are more interested in inviting you to pick the article of your choice and write about it - of course, you can comment also on articles published by other members. Lissan is appearing for the time being in an online form. Our future intension is also to publish it in a printing form. You will be the one to decide which way your article is going to be published; printed, online or both. Our responsibility will be to take care of the layout, the desktop publishing and the screen design part. In letting you have your own way, we are capable of dedicating all of our time to managing and designing. We are aware of the difficulties in realizing our objectives. But it is a path we want to follow because of the immense potential and impact behind this project. For those of you who have sought after the opportunity of making yourselves heard and understood, Lissan will provide you with opportunities. Use Lissan to tell your unrevealed stories. Do not give me the fish but teach me how to fish. We know this quotation for long. unfortunately we could not find both the fish and who teach us fishing. Will we one day apply it and benefit from this lesson that this child tries to teach or remind us? There is hope with al lof us. The best part of all inspiration is a kid telling us how we reach our destiny independently. I am so proud of this lad as if he is my own son. This is one of my favorite site. Well designed and the informations are well chosen. Please keep up the good work. Dear Wendimgeta, we appreciate your encouraging words on our work. Your comment helps us to keep up doing our job. Thanks a lot! We would like to send a press release to you. Reg. the Olympics of ART - ARTIADE 2008 - Los Angeles Beijing. Could you please be so kind and send the editors email address to us? Thanks in advance. My Google alert directed to this fantastic online journal. I am delighted that you are using my review of The Beautiful Things That Heaven Bears. Best wishes to a successful venture. We are also grateful that we could use your review. Thank you very very much. Dear, Adimassu Happy New year. Enkuwan Aderessacehu, the all them. If they Habescha anyways Brother, what about mister. Did you hear any thing.. It was some how interesting for me to took about that. Happy New Year for you too brother. I hope you had a great time on that day. Mistre hasn’t been around for a long time. I hope he is doing good. May be, he will let us know about his current situation when he reads this comment from you and me. hi lissans i want to have a relation with u n please try to send me ur e-mail address bye!!! Welcome abesheet. We are honored to have you here. That quote…show me how to fish…is outdated. In this modern age…one needs to google it how to fish. I am glad that I stumbled on your page. This is what i have been looking for a long time. An outlet to discuss ideas, challenges etc. What’s bothering me is the status of medicine in Ethiopia. Having practiced in both Ethiopia and the US, the question that begs answer is can you pratice modern medicne in Ethiopia with out modern technology ? The exodus of Ethiopian trained physicians a loss or a gain for the country ? Thank you for the enlightening comment. It is true that in this part of the globe we only need to google to know how to fish. It is also true that the town where this kid lives still lacks the luxury of surfing in the Internet. That makes this ancient saying about “teaching how to fish” still actual in these days too. Status of medicine is quite a controversial burning matter in Ethiopia. Like many professionally trained scholars, Ethiopian trained physicians are looking for a better income somewhere else. It is of course a sad reality. If there were a genuine and serious medical infra structure in Ethiopia, it would have been easier for us to blame them for letting their country and people down. Since that is not the fact yet, we tend to hope that infra structures that would keep our scholars at home and bring those who are long gone back home would be implemented some day. The sooner the better. If you are a physician, where did you get your training from? If it was in Ethiopia, you should know that most of the illnesses there did not really require a sophisticated equipment to manage: count HIV, TB, malaria, diarrhea, lower respiratory tract infections, and the neglected tropical disease (mostly parasitic) and you have way over 90% of it covered. As for your comment on the “show me how to fish”, I can only second Admasu’s opinion on that. You reminded of the “qifela” we used to hear as kids. it goes like “ye en’gi’li’z'ua ni’gi’st Elisabeth e’tio’pia’wian te’ra’bu, da’bo te’fto si’ti’bal, le’min kek ayi’be’lum a’letch alu. Hope you see the parallel, my friend the doctor. it has been a while since we dropped each other a line. hope life is being kind to you and your family. All is well at this end. Indeed, it is a sad story with the doctors and medicine. I had a conversation with one of the teachers at the AAU’s medical school while I was back home early this year. As she explained it, the shortage in skilled man power in the health sector is disastrous. It is not only the brain-drain towards the West. Even within the country itself, lots of folks are flocking to those cool NGOs. The poor government sectors have no iota of a chance to compete with the well-funded, well-organized, and well-equipped NGOs and the public sector is bleeding in all directions. On the other hand, the NOGs on the other hand, well, they really need a CODE of conduct because they are hurting those who they are supposed to help, unintentionally, and focus on strengthening the existing infrastructure and new capacity building. The brain-drain to the West.. hmm… that is another matter…will require a much longer text to debate. It was a great pleasure to see your message and comment. Yes, quite a long time since we exchanged greetings and ideas. I am glad to know that you are doing good. The issue on medical specialists that was discussed here is so essential that I want to put together an article of its own. I hope, you will be kind enough to contribute and share your valuable know-how on this matter. Sure, drop me a sentence or two after you post it. Who is suppose to be the teacher? Europians, Americans and now a days asians…..? Who ever so, who teach them to teach us? it is just an entire laziness for the grown up ethiopians to wait for their teacher. The time is everyday, it is never passed rather it always flow, to do something to change the livelihood of us(Ethiopians(or shortly this kid here.)). everyone comes up with diffrent ideas for development but what count is somebods to do something for this need. no matter how there is a way out from our poverty and it lies on everyones hand. Me wiritng this comment is responsibel in my effect for my country and all of us concerned and browsing this site are obliged for the same mission and reason. May the time be now to put a little effort from us for the better future of those kids like this one in this site and for the hole country. I hope you or a collegue will find the time to look at the African School blog. I’ve just returned from time in Addis and Bahir Dar. Would it be possible to send in some poetry I wrote while I was there, for the perusal of your editorial board. Please let me know a.s.a.p. please. We will surely visit your blog.